TEL AVIV, Israel (AP) — Retired Israeli military chief Benny Gantz on Tuesday launched his campaign to be prime minister, presenting himself as a moderate alternative to Benjamin Netanyahu with a message of unity at home, a search for peace and a tough line against the country’s many enemies. Gantz, a tall, telegenic ex-general with salty hair, delivered his keynote speech to an ecstatic crowd of thousands of people. His speech included gestures to Israel’s many interest groups — religious and secular, right wing and left wing, Arab and Jew — as well as repeated jabs at Netanyahu, who is facing the possibility of indictment in a series of corruption scandals. The political newcomer has emerged as the most serious challenger to Netanyahu’s lengthy rule, highlighting how security rules supreme in the minds of most Israeli voters. Gantz is still untarnished by partisan politics and has been riding a wave of popularity, even while saying little and presenting a vague platform. But the shine could quickly wear off following Tuesday’s speech. Netanyahu took to Twitter to brand Gantz as weak. “Whoever says they are not right and not left — is left,” he said. For many voters weary of Netanyahu’s long rule, Gantz’s fresh face is enough of a draw, as evidenced by the crowd at Tuesday’s speech, which was repeatedly interrupted by boisterous applause. 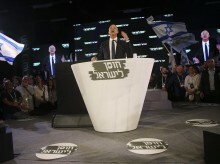 In the speech, Gantz accused Netanyahu’s hard-line government of dividing the nation by inciting against its rivals and failing to address the high cost of living. “The government I lead will strive toward peace and will not miss an opportunity to create a regional change,” Gantz said. But he also vowed tough action against Israel’s foes, including Iran and the Hamas militant group in Gaza. Gantz criticized Netanyahu’s policies in the Gaza Strip, saying that Israel’s actions to contain Hamas had also punished the civilian population. He promised to allow humanitarian aid to Gaza and assist in economic development. “But I won’t allow protection payments of money in suitcases,” he said, referring to Netanyahu’s agreement to allow Qatar to deliver tens of millions of dollars to Hamas in exchange for pledges of quiet. Most polls show Gantz’s new party, “Israel Resilience,” coming in second to Netanyahu’s Likud in a crowded field of contenders in the April 9 vote. A second-place finish would position Gantz for either a top Cabinet post in a Netanyahu-led coalition or to be a high-profile opposition leader. Some polls have him almost even with Netanyahu as far as fitness to be prime minister. None of Netanyahu’s many other would-be challengers come close. Even so, Gantz’s hope of hopping straight into the job of prime minister is unprecedented. Rabin, Barak and others had to work through the political party machinery for several years before coming to power.